The West Side Loop Trail as it heads north towards Brushy Peak. Coppertone and I chose to hike this trail today for a couple of reasons. One, we knew that tree cover would be limited and it made sense to knock this one out before the heat of summer. Secondly, we had just found out about the Regional Parks Foundation Trails Challenge and this one was on the list. We can't resist anything that involves checking things off a list! We were not sure that we'd ever see as many ground squirrels as we did at Cesar Chavez Park recently, but we were wrong. The ground squirrels were everywhere as were their burrows. 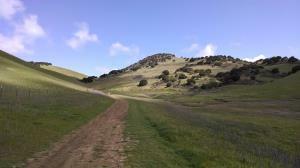 The wide open grassland with only a few pockets of trees afford lots of views in the valleys and out onto Livermore. Parts of the park are actively used for cattle ranching, though the cows are usually keen to keep their distance. At one point some teenagers riled up a group and made them run away. Not nice. Hunger cut our visit a bit shorter than we first intended, but there are plenty of additional trails here to draw us back in the future, perhaps in the fall! Whether you're trekking through the wildflowers of the South Bay or the redwood forests of Marin, get a breath of fresh air with Moon 101 Great Hikes San Francisco Bay Area. Whether you're a veteran or a first-time hiker, Moon's practical tips and comprehensive coverage will have you ready to lace up your boots and hit the trails.